A few days back, I mentioned on this blog that Lobsang Sangay, the 'Prime Minister' of the Tibetan government-in-exile had stated in Washington DC that he accepted: "the Communist Party's rule in Tibet". This raises several questions which should be debated by the Tibetan Diaspora. In the context, it is however interesting to look at a report of the first encounter between the newly-elected CCP's General Secretary and a Tibetan delegation. Ma Haoliang, one of the Beijing correspondents of the Hong Kong newspaper, Ta Kung Pao provided a detailed report of Xi Jinping’s visit to the Tibet delegation at the National People’s Conference on March 9, 2013. Ma was apparently present during the event. Xi Jinping offered the pledge that his new leadership group would pay the same close attention to Tibet as previous leadership groups and would continue to emphasize “the maintenance of stability and leap-frog style development” (weihu wending 維護穩定and kuayueshi fazhan 跨越式發展) following China’s own special pathway and according to Tibet’s special characteristics. Xi however cautioned that there can be no stability in Tibet without economic development. A constant vigilance must be exercised vis-a-vis ethnic problems, sensitive religious issues and sudden waves of Tibet independence sentiment. Xi affirmed that China will not bend to the pressure produced by collusion between foreign hostile forces and those seeking Tibet independence. Xi stated that the special characteristics of Tibet must be respected with even greater protection to its culture and religious faith as well as continuous support for its rapid, leap-frog economic development. The Party’s General Secretary remarked how impressed he was by Tibet during his July 2011 trip for the 60th anniversary of Tibet’s ‘peaceful liberation’. Ma Haoliang, the journalist says that Wang Huning , Chang Xiaobing  and Ding Zhongli  were present during Xi’s visit to the Tibetan Delegation at the NPC. He explained that they were members of the TAR delegation because they represented three faces of the vital Aid Tibet program, i.e., Central Government aid, economic aid and scientific aid. Xi also noted that a large number of senior officials attending the March Twin Meetings in Beijing are presently, or have in the past, directly shouldered responsibilities in Tibet issues; he says that the numbers will only increase in the future insuring that the Centre will continue to pay close attention to this region. The Hong Kong newspaper then mentions the connection of Xi’s father with Tibet (the reporter may have been informed by Wang Huning or Li Zhanshu  of the relations between Xi Sr. and Tibet). The article quotes Xi Zhongxun who was said to be close to the 10th Panchen Lama and who interacted with the Dharamsala delegations in the 1980s when he was responsible for United Front Work. 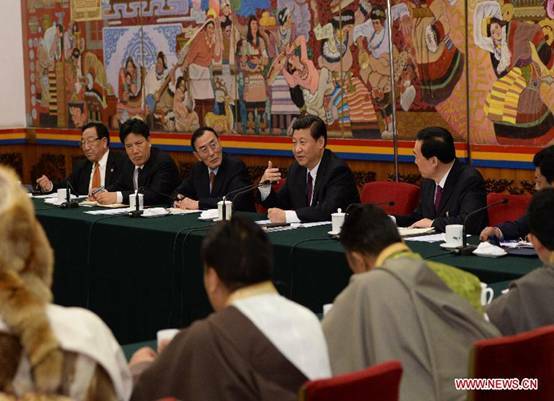 Two days (March 11), the meeting was reported by Radio Lhasa: “Xi Jinping joins TAR delegation's group discussion”. On March 11, TAR party committee Secretary and TAR delegation leader Chen Quanguo convened a meeting of TAR delegates to the 1st session of 12th NPC and read out and studied the spirit of the important speech given by General Secretary Xi Jinping during his participation in the group discussion of TAR delegates. Chen Quanguo said, "We must treat studying, publicizing and implementing the spirit of the important speech of the General Secretary as a vital political task for the present and the near future and seriously study and intensively implement it collectively to gain ideological unity with the spirit of the important speech of the General Secretary. Uniform arrangements must be made for the Central Committee's strategy on Tibet affairs, use the General Secretary's speech to ideological arm and guide implementation and boost work. With clear priorities the nature of the spirit should be understood, the development path with Chinese characteristics and Tibetan characteristics must be followed to achieve speedy economic and social development people's life must be improved and protected and efforts made to en able the masses to lead a happier and beautiful new life. National unity must be strengthened and developed resolutely, the masses of divergent nationalities should be encouraged to share same fortune and same ideology, and co-exist in harmony and resolve problems with united spirit. Basic work for long term stability should be carried out successfully and continued stability, consistent stability and over all stability of TAR must be protected. Building cadres force should be strengthened and the fine tradition of talking less and working more, working with dedication and not leaving till results are achieved should be promoted and relations between the party and masses of divergent nationalities should be strengthened. The foundation of the Party's rule in Tibet should be strengthened so that the important goal of building moderately prosperous society by 2020 along with the entire nation can be achieved. The saying, "Empty talk leads to downfall of the state and practical work leads to growth of the state and practical work leads to growth of the state, must be borne in mind and in accordance with the reality of Tibet responsibility should be increased, methods adopted, tasks divided and implemented to carry out precise development and stability. New steps should be adopted to promote scientific development and swift development, achieve new success in improving people's life, new progress should be achieved in boosting and strengthening national unity, new outlook given to protecting social harmony and stability and new look given to strengthening building of the party". Chen Quanguo stressed that everyone in TAR, from top to bottom, should regard implementation of General Secretary Xi Jinping's important speech as the nerving force and seek truth from fact, be pragmatic, persevere and overcome limitations and through swift development and long term stability make the party central committee led by general secretary Xi Jinping satisfied and create happiness for the masses of divergent nationalities. The province level TAR leaders in Lhasa also held meeting and released and studied the important speech given by General Secretary Xi Jinping during his participation in the group discussion of TAR delegation. Wang Huning became member of the Politburo of the 18th CPC Central Committee in November 2012. Chang Xiaobing served as director of the telecommunications administration department of the Ministry of Information Industry until 2004; he was then appointed as chairman of China Unicom (China United Telecommunications Corporation Limited) in that same year. Ding Zhongli is presently the director of the Institute of Geology and Geophysics of the Chinese Academy of Sciences. He also serves as vice-chairman of the Chinese Quaternary Science Committee. In 2008, he became vice-president of the Chinese Academy of Sciences in 2008. In 2012, Li Zhanshu became Director of the General Office of the CPC Central Committee; he is a member of the Politburo of the 18th CPC Central Committee.